Making homemade dulce de leche (which I never seem to pronounce correctly) is super easy and so much more economical than buying it at the store. And you have a number of options when it comes to method. A quick Google search will yield recipes that can be baked, cooked over double-boiler, microwaved, and even starting from scratch with milk and sugar. Me? I use the method that I think makes the darkest and very, very best dulce de leche. It’s also the method that just about every site in that Google search cautions against: the homemade bomb method. Okay, so it’s not really a bomb. But it could be one. And if you’re smart about it, and maybe even a little lucky, it’s not dangerous at all. 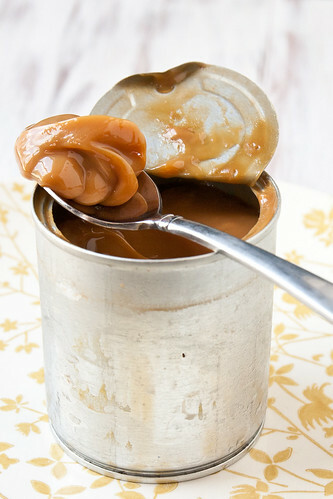 I’ve made countless cans of dulce de leche using the boil-the-can method. No bombs. No e’splosions. JUST KNOW THAT IT COULD HAPPEN. Now go make your own dulce de leche! Making your own homemade dulce de leche is as easy as (carefully) simmering a pot of water. Place a small washcloth or several folded paper towels in the bottom of a pot and set the cans on top. Pour water to reach ~2 inches over the can. Bring water to a simmer and cook covered for ~3 hours, checking every 30 minutes to make sure the water level doesn't evaporate below the lip of the can. Let cool, open the can, and use. Keep any leftovers refrigerated. I use this method for making dulce de leche (and i always pronounce it wrong too!) but I was always taught to never never never, not ever open the tin at all until it has cooled down after the cooking. I have always been taught that opening the tin a fraction is what makes it explode. Certainly having a sealed tin, and making sure the water lever stays topped up has always worked for me. It’s really too simple not to try isn’t it! I’d have to set a timer every 30 minutes though or I’ll forget to refill the water. I’ve been wanting to do this for a while! I have a few cans of sweetened condensed milk in my pantry… might finally be time! I’ve been trying to limit my dairy intake, but as Claire put it, this really is too simple not to try. It looks absolutely incredible. My husband just discovered chocolate Chinese noodle cookies, I bet this would be fabulous mixed into those. *Sweetened* condensed milk. Thanks for the catch! I’ve wanted to make homemade dulce de leche for the longest time, but have always been intimidated. This makes it look easy. Thanks for sharing! Wow I’ve never heard of making your own dulche de leche. What a great idea! I’ve made this a lot and I’ve never popped the can. I always wait til it’s cooled before opening though. My mom used to do this when I was little and we always ate it with pineapple. OMG..this is my favorite and only method of making Dulce de Leche! Dool-say day letch-ay – the Y’s are much softer with a Spanish accent, but just like we say most foreign words in English, try to be semi-accurate without sounding pretentious. 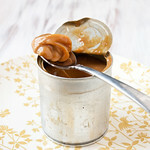 I made dulce de leche last week for the first time using David Lebovitz version and loved it. I think I’ll keep with his version as I’m quite the fraidy (sp?) cat when it comes to this method. 🙂 It looks great, though!! I never open my cans either, but I keep them covered with water and simmer them. So far no problems with explosions! Put into a graham cracker crust. Chill. (I do it over night) you want it nice and cold. Just discovered your blog through a BlogHer referral, and wanted to tell you that your photography is stunning! Really lovely shots and recipes…especially love this dulce de leche one, huge fan of the stuff, it’s so addictive! I have made this many times for “Carmel” sauce no one believes it can be this easy. Tastes great on ice cream, fruit and angle food cake. I have 2 cans, unbreached, in big deep pot completely submerged in water.. when it gets low, i boil a 2nd pot of water and once it’s boiling i pour it in. Making sure the cans stay covered all the time. oooooo! it’s time to take them off! My concern with cooking it in the can is what will leach out of the can and into the finished dulce de leche. The better way is to pour the condensed milk into a canning jar then close the lid. Then follow the directions as above. What’s nice about this method is that you can check to see how dark the dulce is getting as it goes. Some people like it darker and some lighter. I like mine on the darker side. may i know are we suppose to simmer it at low heat for the 3 hours? meaning, once water boils, then i lower to low heat and let simmer for 3 hours? please clarify. thank you dear! During college I tried making this in my mom’s kitchen and got the e-splosion. It was years before she got the goop off the ceiling! Lately I’ve been more careful, but residual glue on the can ends up on the inside of the pan and takes ages to scrub off. I love the idea of using a canning jar, can’t wait to try that! Thanks!